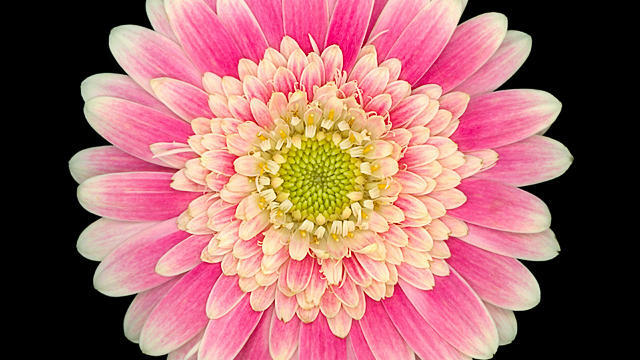 It may look fake, but this gerbera daisy was very real the day that California-based photographer David Leaser snapped the exquisite image. See how Leaser’s gorgeous botanical prints can set the tone for indoor rooms. Three sunny-hued blooms—’Solar Flare’ gazania (left), ‘Tiger’s Eye’ abutilon (center), and ‘African Sunset’ gerbera (right)—wake up an otherwise spare living room. David Leaser was inspired to show off such intimate, inner workings of flowers while in the Amazon jungle photographing flowers on the forest floor, each with its own ecosystem of tiny insects. His collection of bloom images, called “Nightflowers” is a result. A single passion flower bloom, with threadlike purple filaments framing the yellow-green stamens in its center, sets the tone for this office color scheme. The flower in this image is from Leaser’s own garden, where it bloomed on a vine-covered trellis. Two tulips cozy up to one another, providing just a hint of color and motion in an otherwise quiet, vanilla-toned bedroom. That’s “The Swan” (left), and ‘Estrella Rijnveld'(right), it’s petals swirled with raspberry and soft green. ‘Star of Bethlehem’ (Ornithagalum) takes center stage over the fireplace of this earth-toned living room. Called “Cosmopolitan“, the image is presented in a museum-style floating frame. “You will never look at flowers the same way again once you have viewed them this way”, says David Leaser.